No matter the subject, no matter the size – pop quiz or final exam – many students suffer from test stress or exam anxiety. It is important to be aware that your body is making you feel this way for a reason, but there are easy tips and tricks you can use to help you not only reduce your stress but also prepare your mind and body for your upcoming exam. Test stress or exam anxiety can develop for a variety of reasons. The fear of being evaluated and the fear of failure are two main causes of test stress, but there are many different things that can also contribute to your test stress – some you might not even be aware of. Do a quick survey of your current environment and lifestyle, could any of the reasons below be contributing to your stress levels? The good news is that exam anxiety is experienced by many students and is a completely normal feeling. The even better news is that there are simple things you can do to calm your nerves before, during and after a test that will help you deal with your anxiety and improve your study habits. There are three key categories to focus on to help eliminate your test stress. As we mentioned above, things such as poor eating habits, lack of sleep and even too much caffeine can impact your levels of anxiety before a test. The first and one of the most important things to consider when preparing for your exam and also during the exam is to maintain a positive attitude. Your state of mind leading up to and during your exam can help you feel more calm during the test itself. Use positive affirmations and believe in yourself. Negative thinking and self-criticism or having the mindset that you won’t pass will not help the situation. Instead make a conscience decision to prepare for your exam so you won’t need to have these thoughts and feelings in the first place. It’s also important to set reasonable and achievable goals for yourself – nobody is perfect. By setting a target grade you may create unnecessary stress for yourself. Simply do the best that you can. If you feel like your anxiety or stress is getting too much to handle alone, talk to someone. A friend, family member, teacher, school counsellor. Talking to someone about how you are feeling – simply getting the feelings out is one of the simplest ways to help alleviate stress. Now if you were thinking that positive affirmations and getting lots of sleep would get you out of studying, you have come to the wrong place. Taking the time to study, focus and practice the information is the most important thing you can do to eliminate test stress. 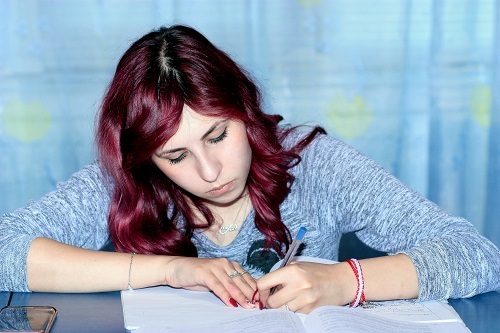 There are a variety of study techniques and methods out there that have been proven to help students study and retain information. However, there are also some study techniques that are not an effective way to study. These include cramming the night before, simply memorizing your notes or textbook, and binge-studying all in one sitting. It’s important to plan your study time in advance. Too much material covered in too little time is a recipe for anxiety. Experts suggest to plan your study sessions to be roughly 50-60 minutes long, separated with 5-10 minute breaks. The sooner you start studying the material the better prepared you will feel, but it will also allow you time to ask questions if you need clarification or don’t understand the material in advance of the test. Another thing you can do to eliminate anxiety before the exam is to ask your teacher or professor exactly what to expect during the test – what do you need to bring? How long is the exam? Are there certain areas of material that should be focused on? Teachers are there to help you succeed, not to watch you fail. Ask them for helpful tips. You check your work one last time, cross your T’s and dot your I’s and put down your pencil. The test is over. You need to keep in mind that your behaviour immediately following the exam has just as much impact on your stress levels as your pre-exam behaviour. Chatting with classmates after the exam and hearing their thoughts can impact how you are feeling about the work you have just completed. In addition, misery loves company, so if someone is criticizing themselves for not doing a good enough job that mentality can become contagious. If you are going to meet up with someone, you should suggest that you will only talk about the exam for 5 minutes – or even not at all. It’s important that you let the stress of the exam go, especially if you now need to shift focus to more exams over the next few days or weeks. Whatever you do, don’t criticize what you can’t change. Remember, you did your best, what’s done is done, simply take a deep breath and wait for the evaluation to come through. Instead of focusing on the outcome or grade, consider rewarding yourself for the time and energy put in to prepare for the exam. Put less focus on the outcome and instead reward yourself for knowing you studied and prepared as hard as you could. Nerves and a little bit of anxiety are completely normal when you are preparing for a test or exam. If you are feeling overwhelmed with exam preparation, school, or simply life in general, the counsellors here at Calgary Counselling Centre can help. Click here to learn more about our counselling services and register for counselling today. This entry was posted in Blog, Counselling and tagged anxiety, college, depression, exam prep, mental health tips, self-help, self-worth, stress, students, study tips, studying, tips, university.